Weight: Lead wire, sized to hook. Hackle: Brown Rooster Saddle, look for something that is relatively soft, but still long enough to palmer over the body. On smaller flies you can even get away with a good quality hen neck. Thorax Hackle: Same as body hackle. After doing some research in Perrault’s Standard Dictionary of Fishing Flies, it was amazing to find 23 variations of the Gray Hackle series. Some flies in the series even have their variations. I am using one book for the pattern recipes of this series but suspect there may be more out there, such as regional, personal recipes etc. 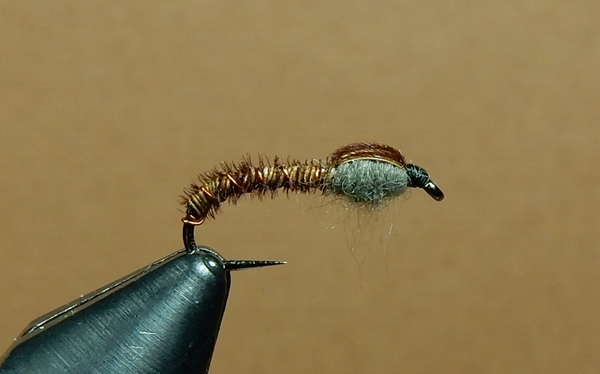 These flies can also be tied as wet flies. Try different color rear hackle but keep the white up front. The Prism was first tied by Mark Bachmann in the early eighties. He designed it to be an unobtrusive pattern for low, clear water. However, during the time period mentioned here, the water was medium level with visibility that averaged four to six feet. This is normal October conditions for the Deschutes during good years. In October, many summer steelhead have been away from the Ocean feeding-grounds for several months. They start to forget about the brightly colored marine organisms that nurtured them there, and begin to turn "trouty" in their behavior, looking for things with more freshwater coloration. The Prism turned the trick. Several very large steelhead have been taken on this pattern. It has proven itself very useful as a come-back fly, after steelhead have risen to, but have refused a brighter colored fly. Use substitute materials where necessary.